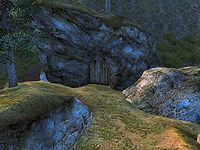 Nonwyll Cavern is a medium-sized cave north of Chorrol containing monsters (quest-related). 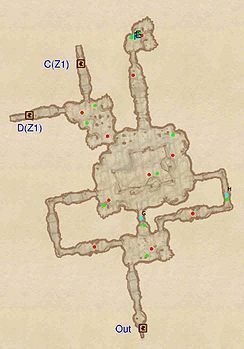 It contains two zones: Nonwyll Cavern and Nonwyll Chamber of the Titans. This cave contains 8 Cairn Bolete plants and 10 Wisp Stalk plants. Although there is a cell named NonwyllCavernExterior, the entrance to the cave is actually in the cell HighlandsWilderness. 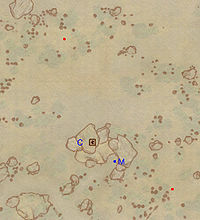 This location's map marker (M on map) is named Nonwyll Cavern (editor name NonwyllCavernMapMarker). The entrance door is NW of the marker, 50 feet away. This zone is primarily used as part of the fighter's guild quest, "The Master's Son", because in order to complete this quest, you must travel through this zone into zone 2. There are two doors leading to zone 2, (C), and (D). 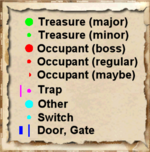 Taking door (C) is far safer, as you cut the dungeon in half, and end up in roughly the same place that door (D) takes you. However, if you decide upon taking the (D) route, then you will find three more minor loot chests, but have to fight two more enemies. Also, the trolls do not respawn while the chests do, so after you have cleared the dungeon you can return here for free loot. The primary use of this zone is to find Galtus Previa's body as part of the aforementioned fighter's guild quest. There are three doors into this zone, doors (C) and (D) correspond to the doors from the first zone, while there is another door to the south of the cave that leads to the wilderness. 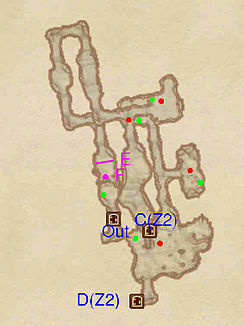 To get to the main cavern of this zone from the back entrance, you must take the left path, as both other paths are blocked by rubble marked (G) and (H). Entering the cave the back way is preferable if you want to bypass zone 1, and don't mind foraging around in the wilderness to find this back entrance. The monsters in this zone again do not respawn, while the chests do, also allowing for easy loot after you have cleared this cave out once.